EU countries lag behind in phasing out single-use plastic bags and curbing plastic pollution, warned Surfrider Foundation Europe and Zero Waste Europe on the 9th International Plastic Bag Free Day. According to the report Still Finding Excuses? 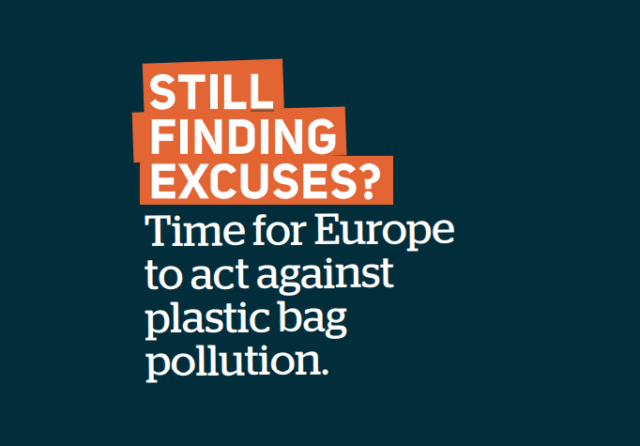 Time for Europe to act against plastic bag pollution, released today by SFE with contributions from ZWE , on the implementation of the EU legislation on plastic bag reduction adopted in 2015, more than 18 months after the deadline for transposition the measures adopted remain largely insufficient in many Member States. Justine Maillot, European Affairs Officer at Surfrider Foundation Europe, said: “In too many EU countries the measures adopted so far are at best half-hearted. There is no excuse for further delay. Governments must raise their level of ambition to match the urgency of the plastic pollution crisis and the concerns of EU citizens” . Rather than banning single-use plastic bags, most countries have opted for either voluntary agreements with the retailers or for a charge on lightweight carrier plastic bags, which in some countries will only come into effect next year. Although a tax can have an impact on consumers behaviour, ZWE and SFE highlight how phasing out single-use plastic bags will require a restriction on the supply side. In addition, in many countries the charge is often too low, or limited to too few retailers, to really spur change. A lack of control and enforcement is also hindering real change on the ground. “The lack of ambition from many governments is at odds with the commitments to tackle plastic pollution worldwide, and with the “race to the top” called for by the European Commission”, said Ariadna Rodrigo, Product Policy Campaigner at Zero Waste Europe . For ZWE and SFE, this is also a missed opportunity, as where ambitious measures, such as bans, have been implemented, they have been successful in reducing plastic bags consumption and largely supported by citizens . The report also highlights concerns regarding the exemption from any tax or restriction for very lightweight plastic bags, as well as bio-based and biodegradable bags. ZWE and SFE highlight how this constitutes a major contradiction in the fight against plastic bag pollution and throw-away culture, and emphasise that existing reusable alternatives, such as tote bags or baskets, must be prioritised. SFE and ZWE, as members of the Break Free From Plastic global movement , call on Member States to urgently implement the EU Plastic Bag Directive and put an end to plastic bag pollution, in line with the EU strategy on plastics and the promotion of a true circular economy. Zero Waste Europe calls now on Member States to promptly transpose the adopted safeguards and to exclude any support for fuels from plastic, so as to ensure compliance with EU legislation. Early June, the Indian government pledged to ban all single-use plastics by 2022. In Italy, since the introduction of the ban in 2011, the consumption of plastic bags has reduced by more than 50%. Break Free From Plastic is a global movement envisioning a future free from plastic pollution. Since its launch in September 2016, over 1,279 groups from across the world have joined the movement to demand massive reductions in single-use plastics and to push for lasting solutions to the plastic pollution crisis. These organisations share the common values of environmental protection and social justice, which guide their work at the community level and represent a global, unified vision. On the 9th International Plastic Bag Free Day, EU countries still lag behind in phasing out single-use plastic bags, according to Surfrider Foundation Europe’s report.